There are several bands by this name, the most popular being the old school thrash metal band from Corups Christi, TX USA. There is also an old thrash band from Illinois by this name as well as a black/war metal band from Vancouver, BC CANADA. 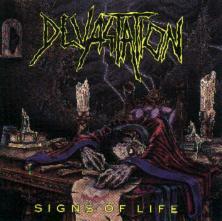 Thrash metal band formed in 1986 in Corpus Christi, TX, USA. Their first show was opening for Anthrax in Texas that same year. Despite growing popularity, the band came into hard times due to lackluster label support in the 90's and broke up after the tour for their third album "Idolatry." 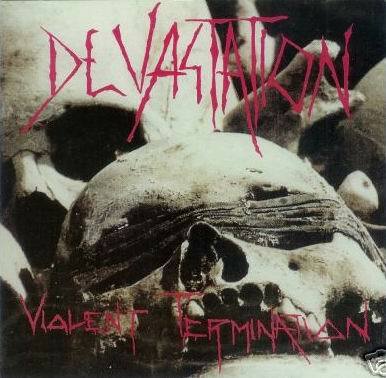 "Violent Termination" is old school thrash with an almost Venom-like musical quality. Unlike the band's follow-up releases, however, this one isn't quite a manic. That is not to say it's not good or that it's not heavy, because it is. There is just a different feel to this one than either of the band's follow-up albums. Whereas those two albums border an a death metal sound, this one is delivered with a punk aggression and is certainly influenced by bands like Venom, early Slayer and even a bit of classic metal like Anvil and Priest. Personally I really dig the true metal roots peaking through on this CD.Heavy as a 100 ton wrecking ball coming full force through a brick wall "Signs of Life" is full throttle, testosterone ingested, adrenaline rushing, heavy metal that straddles as fine line between death metal and thrash metal. Devastation don't let up on the speed or intensity for one second. The production is raw and heavy and only adds to the the overall appeal. 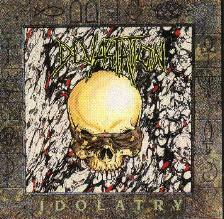 As with "Idolatry", this album was out of print for a long time and highly sought after by collectors. Fortunately in 1998 Century Media rereleased almost the entire Combat catalogue. The re-release contains an expanded, full color booklet with photos, lyrics, a short bio, and a small letter from bassist Edward Vasquez.Idolatry is one of the heaviest thrash metal album ever written, ranking up with the toughest of thrash monsters; Possessed, Dark Angel, Death, etc. 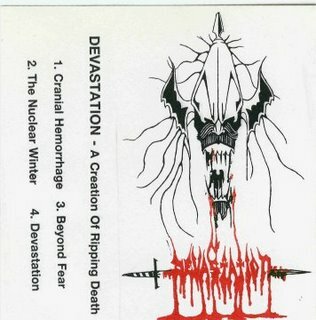 As with those bands, Devastation were one the borderline of death metal, but never actually crossing over into blast beats or growling vocals. The guitars on this CD are vicious, being produced by legendary metal factory Morrisound Studios. Unlike the bands that Devastation were compared to, these guys lyrics were very anti-Satan. I am not even suggesting that they were a Christian band, but only that they seem to take an opposite stance that bands like Slayer and Dark Angel were taking in the late 80's. Check out the lyrics from "Souls of Sacrifice" below. In 1998 Century Media reissued and remastered this CD with additional liner notes and several live bonus tracks.